Social media is becoming increasingly important to accessing and getting a job. Create a social media profile on sites such as LinkedIn. LinkedIn offers veterans a free upgrade to premium services. Be sure to also network by talking to friends, family, and current and former colleagues. 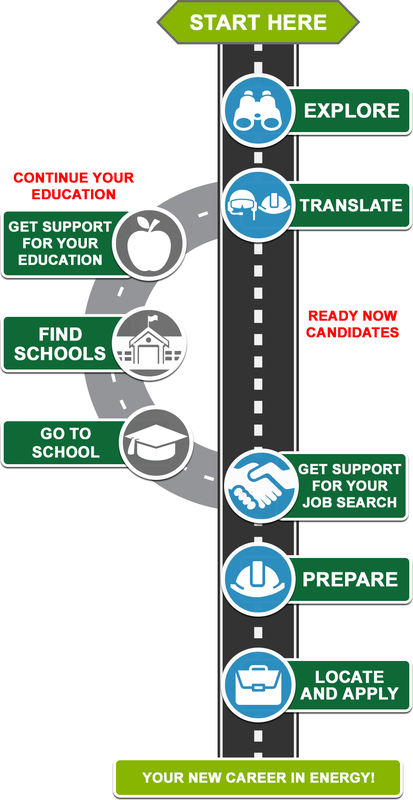 Translate your military experience into a strong resume, as very few employers understand the scope of your military experience and training. When writing your resume, showcase your accomplishments, including the specialized training you have received. Your military experience is an asset and should be marketed in a way that speaks to employer needs. Hire Our Heroes helps veterans develop and build their own brand. Practice makes perfect, so participate in mock interviews at career fairs, on bases, or at Veterans Service Organizations so you can learn to translate your military skills into terms energy employers can understand. Many utility companies use a pre-employment test as one of the initial steps in the selection process. To pass, you will need math, communications, problem solving, and mechanical reasoning, so you may want to brush up on the basics to gain employment in the energy industry. To help increase your success, the Edison Electric Institute (EEI) has developed practice tests. Although these tests will differ slightly from the real test, it would be beneficial to become familiar with these tests, as it will help you understand the test better and may increase your chances of qualifying for an interview. A Get Into Energy Test Prep Independent Study Program is available and gives individuals the opportunity to brush up on their math skills as well as prepare for the EEI or other employment tests required by most companies. The structure of the program allows candidates to take pre-tests to determine which areas they are in need of some lessons and practice problems.